Today I'm styling a Mixed Material Top by Kut From The Kloth. This top is so comfy! It's a very lightweight material, making it perfect for the cool weather this time of year. The front and back is a polyester type fabric and the sleeves feel like a thin sweatshirt material. 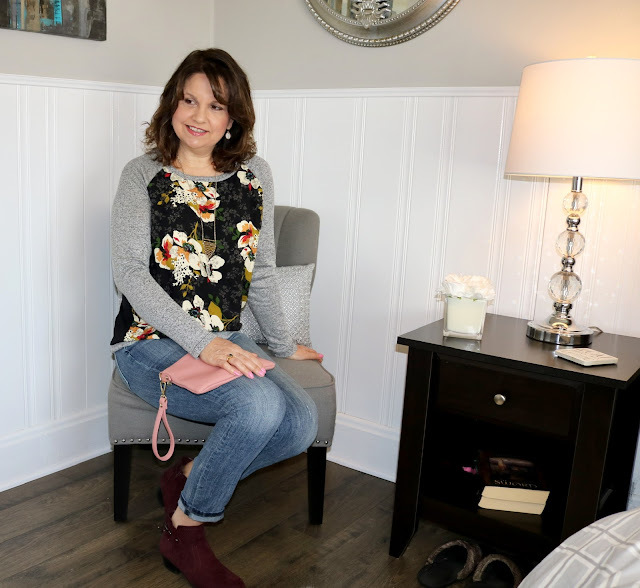 I styled the top with a grayish blue pair of boyfriend jeans, burgundy booties, gold jewelry, and I carried a blush pink purse (all old). 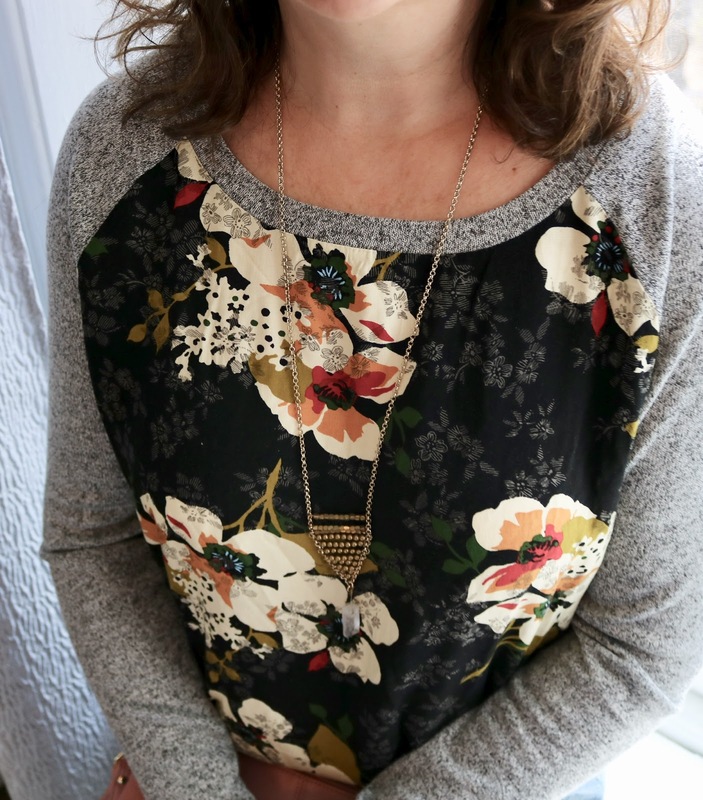 The front of the top is a floral, but the back is solid black. For jewelry I chose a gold pendant necklace and gold drop earrings. 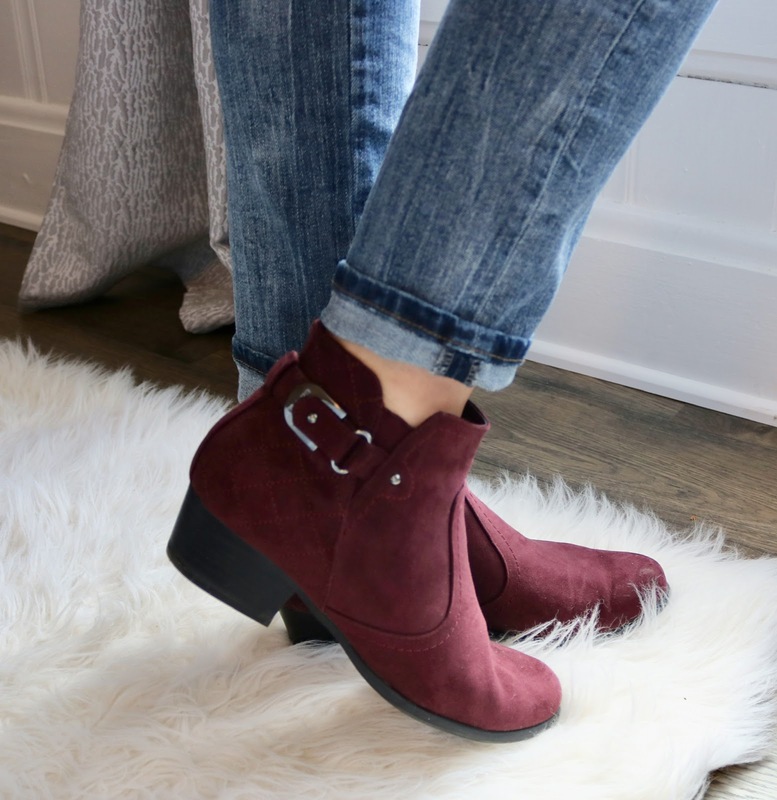 The burgundy booties really complemented the top well, adding some color to an otherwise neutral outfit. 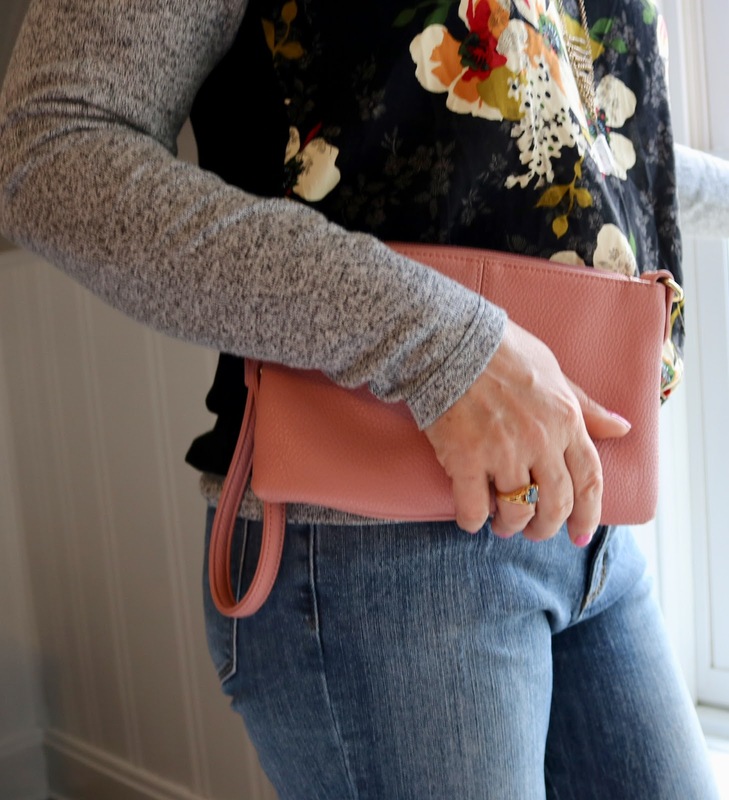 The blush handbag is a little bit dressier which helps keep the outfit from becoming too casual looking. I really loved the soft feel of this top and how good it felt to wear. I also enjoyed the mix of both casual and dressy within the top so I could dress the top either up or down depending on how I would like to wear it. 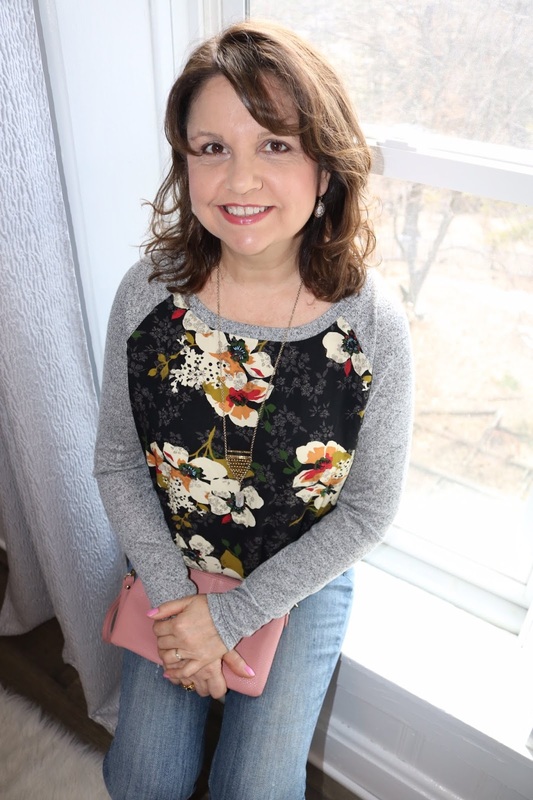 I received this top in my April box from Stitch Fix. I'll let you know when I do my April Stitch Fix Box Review if I kept it or sent it back. If you've never tried Stitch Fix before and would like to receive $25.00 off your first box, use my code HERE! I love how the sleeves are solid and the body is print, Amy!! Yes that’s a unique feature! Thanks Christina! My stylists suggested burgundy booties and I thought that was a great idea! Very cute! I love those boots. 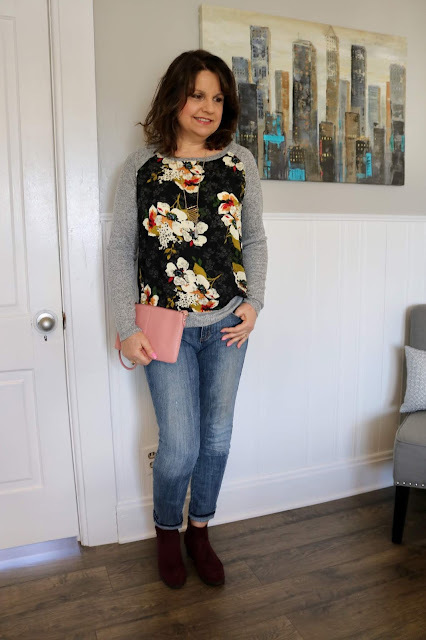 I think I voted no for this top on Instagram, but now seeing in here on the blog I actally love the look and it's so perfect for this time of the year! Well I’m glad you found the Instagram Poll Elllie! Nothing in this box polled well, which really surprised me as I thought it was a pretty good box. I think Selfies also don’t show the best views, so that could be part of the problem. This is a lovely spring styling...love the mixed material top. Thanks Mica! You’ll find out soon! 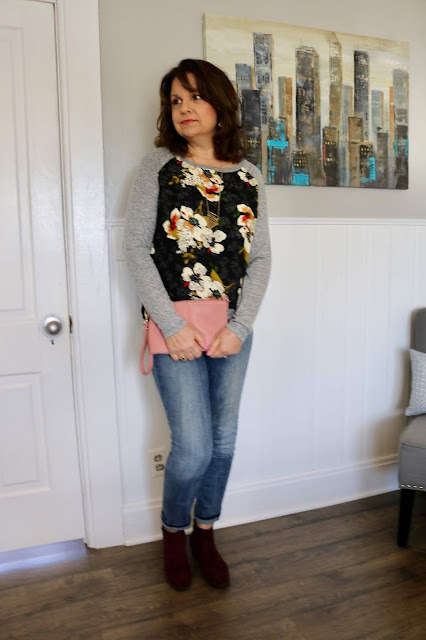 Love the colors in the florals on your top. Very pretty! Looks great with the burgundy adding more color. Thanks Jess! 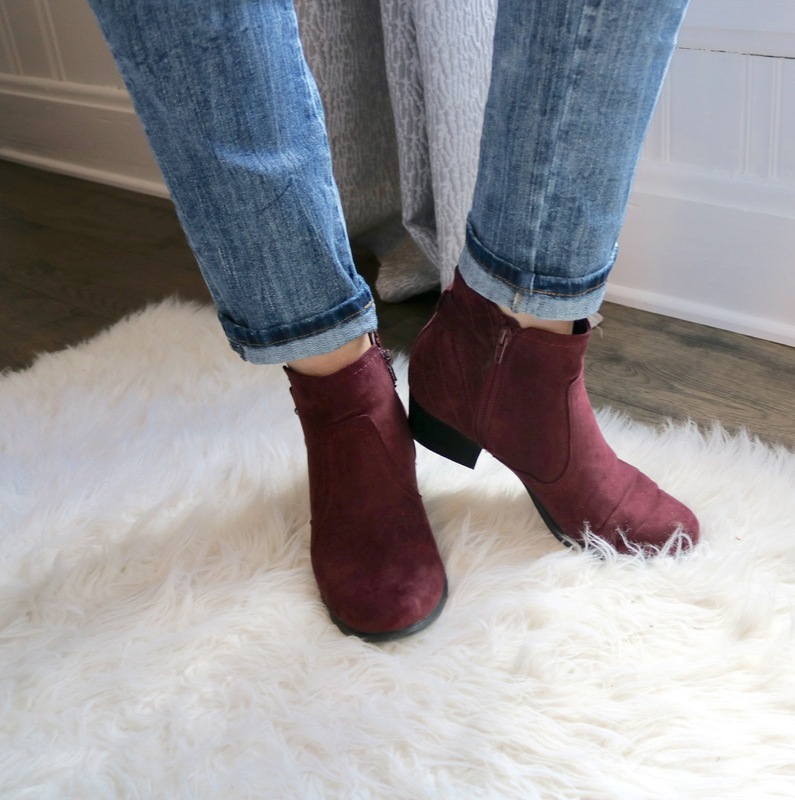 The burgundy was suggested by my Stitch Fix stylist and she was so right! The top is really fun! I love the different prints and how you styled it! Love your post. perfectly composed article. Thanks for posting. Cheers!